For our last full week of class, we focused on art’s ability to influence social movements. Art is extremely multifaceted, which makes it the perfect tool for communicating values, drawing interest, and motivating community members to take part or join a movement. A more simple work can easily and quickly communicate a paramount message. Complicated artworks can invoke fierce or profound emotions in a viewer and force them to look at issues, that they may have found trivial before, differently. The resources necessary to create art are practically accessible to everyone. This is significant because it grants people the opportunity to publicly question hegemonic ideals and guidelines. The wide array of art forms give everyone with some form of expression or style; people of different interests, origins, ages, and values. With such a variety of approaches, art provides movements with a means of connection with outside communities. By connecting with these outsiders through art, movements can attempt to shift or transform the outsider’s frame of reference or analysis in which they use to look at a movement, view an issue, or feel about a social concern. This concept was highlighted in our course when Kathy had us take part in a group activity about music. 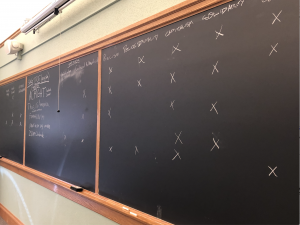 Each class group picked a contemporary song that related to protest and wrote up three words that represented the primary focuses of that song up on the board. Every group chose a hip hop or R&B track, many of which had similar messages and intentions. The activity allowed us to physically see what social issues are dominating our society today and highlighted how art’s versatility provides movements with a means of granting people a greater understanding and accessibility to a cause. This past week, we dove into the processes of how one enters and, more importantly, stays relevant in the art world. A variety of intricate social circles, firms, and gate keepers dominate the art world. To be a part of a movement, is to join and work in a specific stylistic group. To get one’s work out into the public, an artist must network their way to the top and strike a balance between following social conventions and being innovative. From there, it’s a constant competition to stay in front of the public eye in the overflowing realm of art production. Those who end up being the most successful are those that work with the market, not against it. Kathy provided us with a prime example of what a superstar looks like by showing our class the film, Sing Your Song. 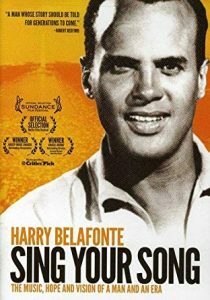 The documentary follows Harry Belafonte’s journey to success. Belafonte networked his way to the top, introduced new styles of music while working with the market, and used his platform to promote social activism. He constantly evolves his art styles and strategies for activism, in order continuously do social work that is beneficial, and to push art and music into new waves. The second primary focus of the week was the audience. The audience is who gives meaning to an artwork. Art communicates through symbols that represent universal ideas. Art, social groups, or movements begin to become powerful when they harness the power of symbols through bricolage, the application of new meanings or definitions to symbols that are outside usual social conventions. The art world operates by a series of rules and is much more exclusive than it seems. I realized that the fundamental steps to becoming a successful artist should be applied to my life and can serve as key strategies in the development of my success. I also recognized that, without an audience, the art that society, my community and I make becomes pointless. Art is unable to stand alone, it must be understood by those who consume it. Now we come to ask, “Do artworks and movements actually matter?” We’ll see what third week has in store. On Friday I finished my first week in Kathy Giuffre’s Art and Society block and I can already tell that this block will be one to remember. On the first day, I wasn’t sure what this class had in store. As we moved through the week, we developed a definition for art, discussed art’s role in satisfying the subconscious, highlighted forms of propaganda, and designated what aspects are critical to the relationship between society and art. Everyday Kathy introduces a new perspective to our class that we then used to unpack the relationship between art and society. One of my favorite elements of this course is that for each key concept or issue we discuss, Kathy ties a physical experience to it. For example, we read an article last week, “He’s a Cripple an’ Needs my Love,” which discussed the latent impacts of The Gershwins’ Porgy and Bess, an American opera that showed around Europe during the 1930’s. Our class listened to Billy Holiday, on vinyl, in the dark, while eating chocolate because 1. It was an experience that Kathy believes everyone needs to have and 2. It provided us with a clearer picture of what the audience we had read about that day may have experienced. We also visited the Fine Arts Center and have been consistently tying the works that we saw in the museum back into our class discussions. I enjoyed being introduced to a series of new lenses last week through which I can now use to see the art world in different ways. I’m excited to see how our class uses these new perspectives to further dissect the relationship between art and society.